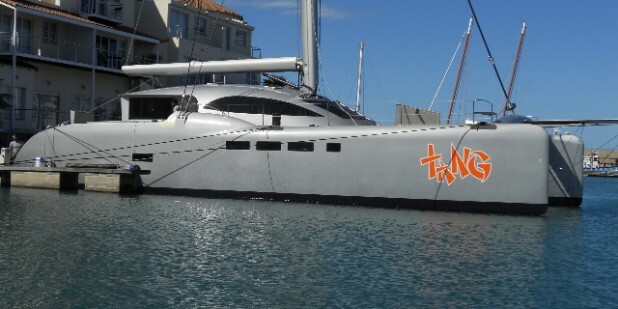 The TAG 60 was designed as the one of the most complete concepts yet seen on a sailing vessel this size. One of the TAG 60s primary features has been to develop a vessel that can offer the “feel and exhilaration” of a performance racing vessel, yet be able to be handled easily and safely in all situations and conditions. Performance cruising is an over used word these days. Just about every new vessel offers this statement as fact. Yet what does it really mean? From the TAG 60 point of view, we wanted to offer a vessel that gave the helmsman great feedback and pure exhilaration at all times. A real sailor’s vessel. The TAG 60 should be performing equally well in light airs, as well as heavy airs and indeed all points of sailing. Upwind it should track fast, point high and tack through 90 deg. Downwind it should be able to create good apparent wind and sail at low angles, accelerate in gusts and reward good set up and sailing. Sailing in flat water is one thing, sailing offshore in waves was another big consideration when considering a catamarans performance. -The TAG 60 has a very high bridge deck clearance of over 1.3m. This gives it a 4WD capability to glide over the worst seas and chop. Not only is this a performance attribute (by not being slowed by waves hitting the vessel) it also increase the crews comfort and most importantly “confidence” which in turn allows the crew to sail into stronger winds/waves and push the vessel harder than is normally the case with a conventional design. -In conjunction with the high bridge deck clearance is the higher than normal freeboard. Although not immediately obvious as the TAG 60 is a very sleek vessel, the fact remains that not only did we design it with high freeboard – the wave piercing bow design features narrow waterlines and minimal forward deck area – yet it has significant (vertical) reserve buoyancy within this performance shape. -The forward beam is a very unique design that curves upwards to produce not just a nice aesthetic, but is also designed to clear the water should the vessel sail into waves, meaning the vessel does not trip, but sails through any wave without slowing down. Again – this is a great offshore sailing feature and allows the crew to sail with confidence, even in the most severe conditions. -Having high aspect centreboards and rudders provides the TAG 60 with a high lift/low drag solution, however the real key to pointing high and footing fast is the ability to power the vessel up and have a flexible, yet very powerful rig and sail combinations. The TAG 60 features a ORMA 60 inspired rotating carbon wing mast. The ability to rotate the mast and create a powerful mainsail shape that really comes into its own once you crack sheets even slightly. The TAG 60 features a very large light air headsail that is very long on the foot length and overlaps the mast so in winds of under 10 knots this sail powers the vessel up to hull speed very quickly and most importantly it presses the leeward bow hard creating lateral resistance and pointing ability. Once pressed the vessel is always hunting to point higher and its this sort of characteristic that you need in light airs. To balance this large headsail, is a very heavily roached and powerful mainsail that when sheeted hard and in combination with the light air headsail, will have the TAG 60 pointing high and footing fast. It’s this kind of sailing ability that makes the TAG 60 very exciting and rewarding to sail and very unlike most other sailing catamarans. -Having a powerful rig and sail combination is just one aspect of the TAG 60s performance envelope. Looking deeper into the vessel, the TAG 60 is constructed 100% from carbon than is cooked under pressure, resulting in not only a very strong and light structure, but a vessel that is inherently very stiff and powerful. Unlike most cats this size – the TAG 60 can fly a hull and most importantly – handle these max righting moment (RM) loads with ease. That does not mean you need to fly a hull to go fast, but what it points towards is the fact that if you have a very stiff structure (that does not bend or break), It means you can apply very high loads into the structure with confidence and utilize the full power of the rig to 100% of the vessels capability. This really pushes the TAG 60 into another realm of ability that few cats reach. Helm position – This is the first large Catamaran that I have sailed where you truly feel connected and part of the boat. The position gives you a perfect view of looking forward to see the oncoming sea so that you can stay in the “groove” and react to an changes. One can see straight down the outer hull and you can sail the big cat like you would a beach cat. This allows for a smoother and more responsive ride. View of the sails – The helm position also gives you a great vantage point to view the sails. Trimming is precise with the hydraulic system. Rudder response – The feel of the solid link steering system is direct and gives good feedback. Once again you feel as if you are part of the boat. You can truly sail the boat on feel. The instruments are there but this design allows you to feel the performance and when you are in the groove you can really experience the sailing performance. Handling various sea states – Even when sailing into short choppy seas, the motion is comfortable with no slamming or pounding. The boat is very stiff and there is no flex in the structure. This makes the motion very comfortable as the response to the sea state is very direct. Tacking – Tacking is smooth and the boat passes through the eye of the wind easily. Even if you don’t have max speed there is little chance of stalling. The boat is really maneuverable. Reefing and rigging sails – With the leisure furl in-boom furling mainsail it’s really simple to hoist and reef the sail. The sail is hoisted on a hydraulic winch and the in-boom furling system is also hydraulically operated so at the touch of a button you effortlessly hoist and lower the sails. Hydraulic operations – It takes some getting used to but having the convenience of push button control allows you to manage, trim and sail the TAG60 with ease. The helmsman can make adjustments without asking anyone to help or having to relieve the helm. Physically it is obviously less demanding and this means you will constantly trim the boat as needed. Electric propulsion – The regeneration creates 1-2 knots of boat speed loss but charging from 5-20 Amps per motor = 750 – 3000W. This is over and above what the system is using whilst sailing. You can generate more power than you can use. As you top up the batteries and maintain full charge and power usage at the time, you can then feather the props to minimize drag. At max speeds you’ll generate as much power as possible and then back off when u top off the batteries and feather the props via the variable pitch prop system and minimize drag. This way you can cross an ocean without using fuel. What a beautiful thing!!! Cruising range = Up to you!!!! Comfort – What more do you want/need. Cruising at high speeds reaching your destination in minimal time and all the creature comforts of home – Filter coffee, movies, music, all the electronic mod cons. As well as the more mundane comforts of dishwashers, washing machines, central vacuum system, dryer, sauna (custom option), ice maker and digital control over all electrical systems. Hi Greg, We sailed around to CT recently as you no doubt know. I heard your explanation of the bow design as far as piercing the waves goes, as opposed to hitting them, then stopping, and then hobby horsing over the top. Having done substantial time on various yachts I have always been impressed by this boats ability to absorb any choppy, unorganised, uncomfortable seas and it has stood out particularly so far, however, en route to CT, I was called for some reason just before 3 am, after which the wind started picking up more and more. It was a great opportunity to “ease” further and further into bigger & bigger seas and wind, broad reach with mostly following unorganised sea. After literally falling down a wave clocking 18.7, I took over from the auto pilot which had became quite busy at the time and was actually coping rather well but was at it’s limit, I also thought I could surf better than it. The wave we fell off was your typical bury the bows type, but there was not even an inkling. We were doing the longest surfs ever, and very regularly, in fact we were surfing most of the time, having “a little more” sail up than necessary, this was easy. The sea became “worse” and we saw 19.6 at one stage. The bows would be completely out of the water and then straight into the next wave. It handled it beautifully. Not once did it even feel like we were pushing it, but it ate everything in front of it. Not much water on the deck, the odd wave that hit the side created a reasonable river but otherwise it was reasonably floodless, considering the conditions. The bows were often deck level in the water as well but there was absolutely no “bow stuck in syrup “ feel to it. We got one entire hull out of the water, which most passengers were unaware I think, when we spun her around to reef in ridiculous conditions. This only happened because that hulls supporting wave disappeared from beneath it but it was quite unique peering over the edge at the whole side of the yacht with the dagger board putting in some drying time. The bottom line is that I think the “Bow concept” is a huge success and the boats ability to stay straight through nasty seas is tops. If you saw how it handled the seas coming at us while we reefed as well, normally the lads at the mast would have been a lot wetter with the trampolines contributing to the fishing industry, but it was quite steady. This stands out the most to me. The rudders are perfect for this boat as you really feel when you start to get over powered or the sails are out of balance, but I’d be inclined to add more leading edge back to them if we want to do more big boy speeds in what some may term ridiculous conditions.